A meeting of the Blue House, the ruling Democratic Party and the related ministries came to a conclusion that the government alarmed by 'the July job report' will respond to the worsening job situation through the expansionary fiscal policy by making an appropriation of larger budget for the job creation for the year 2019 compared to this year. While accepting "the recent sluggish employment situation a very grave and serious matter", the meeting said that "the government will make use of all available policy measures to change the employment trend toward the improvement." 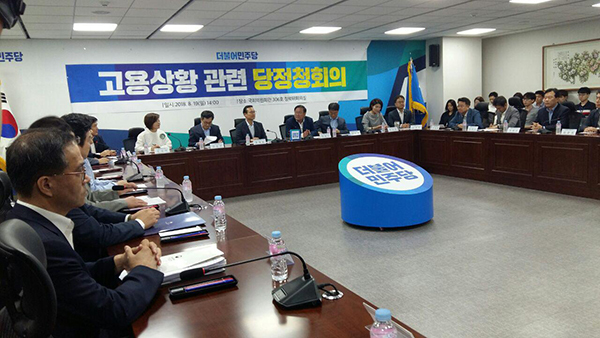 The meeting was attended by Rep. Hong Young-pyo, floor leader of the ruling Democratic Party, Rep. Kim Tae-nyeon, policy chief of the ruling Democratic Party; Finance Minister Kim Dong-yeon, Employment and Labor Minister Kim Young-joo; Blue House senior policy adviser Jang Ha-sung. The reason that the meeting was urgently called was that the July employment situation released by the Statistics Korea on August 17 showed an meager increase of 5,000 jobs compared to the last year. In July last year, jobs had increased by 314,000 compared to the month of the previous year. The job increase this year was on the downward trend with the increase of 123,000 in April, 72,000 in May, 106,000 in June and 5,000 in July. 청와대·정부·민주당 "재정확장 통해 고용쇼크 돌파"